Camping Le Paradis är en camping i Sérignan, Hérault. Campingen har platser med stängsel, med skugga och platser med lite skugga. Det finns möjlighet att hyra husbilar. På campingen finns en lekplats. För den sportige semestervandraren har campingen olika cykelleder. Vem vill inte efter en hård dag slappna av i en jacuzzi. Campingen förfogar över en utomhusbassäng. Att laga sin egen mat är inte alltid nödvändigt, för på campingen finns en snackbar, en pizzeria och en restaurang (mindre urval). På campingen kan du också köpa färskt bröd. Det är möjligt att komma ut på internet, därför att det finns en trådlöst internet-punkt och på 80% av campingarna kan man komma ut på internet med egen laptop. Denna inspektör gör varje år ett besök på Camping Le Paradis och inspekterar campingen för ca 200 faciliteter och för andra förekommande punkter. Inspektören är en medarbetare från ACSI och arbetar inte för campingen. This was our second visit to this site, we were made very welcome. The pitches are spacious, facilities centrally located easy access for all, always clean. A short walk to Carrefour and Lidl. The village of Serignan was an easy walk away and very attractive with a river running by. we phoned in advance and were assured there were plenty of vacant pitches on arrival we were handed a site plan and told to go and choose up to three pitches we returned to the reception to be told none of these were available and to go and look again after the third lap of the site I asked the owner to maybe tick on the plan just which pitches were available and was told they didn't do it like that so I then asked if she would come and show me which pitches were available as after traveling six hours I didn't want to spend another six traipsing round her camp site she then told us of three that were empty and not reserved two of them were to small for our unit the third was void of any grass and like a piece of scrubland had it not got well into the afternoon by now we would have left although she did say we could change pitches later in week not really an option once awning ect. had been erected . The showers and toilets were spotless clean and well maintained and always plenty of hot water . The swimming pool beware has many rules no beach bags,no sun glasses , no sun cream, no drinks , and sun loungers must not be re positioned . compulsory wrist bands. Any group activity such as sitting chatting with other campers must end at 10.30.pm. the owner patrols the site to make sure this rule is upheld hence it is a very quiet and peaceful site. Two supermarkets are within walking distance . We had originally planed to stay in the area for a couple of weeks but on day four I put my car on the pitch next to us as it was empty thinking if someone wanted the pitch I would shoe horn it back on to my own pitch I was promptly told to move it to the parking lot near the reception this I would have been happy to do had the place been packed. This was the last straw left after four days. Paradis indeed! One of the best camps we have found. Everything you expect plus lovely well-tended grounds. Feels like rural quiet although a main road and retail park nearby (Lidl, Carrefour), the only sounds are birds (at night). Wifi free for 2 half-hour sessions per day at the reception. Great for cycling, especially along the Canal du Midi to Beziers. Staff very friendly and helpful. Definitely recommend. This is an excellent, quiet, camping site which is family run. Good shopping nearby with Carrefour and Lidl just over the road. Our welcome was excellent even though we arrived at lunchtime out of office hours. There is was none of the brashness of the larger sites and this suited us well. The sanitary block is very new, works well with lovely hot showers and was always clean. At the end of our stay we were sorry to have to leave and would happily go back again. There is plenty to do in the area with long beaches and countryside to explore. A lovely site in a very convenient position for shopping and beaches. The proprietor could not have been more helpful when my car broke down. They were fantastic. Site highly recommended. A very welcoming site with very friendly owners. The pitches are generous and set in a well kept, mix of shaded and unshaded pitches with ornate surroundings. We really enjoyed our stay here and Madam even made sure we could watch the European Rugby Cup Final on the bar TV. Highly recommended. Vill du boka Camping Le Paradis eller få mera information? Det går bra med nedanstående uppgifter. 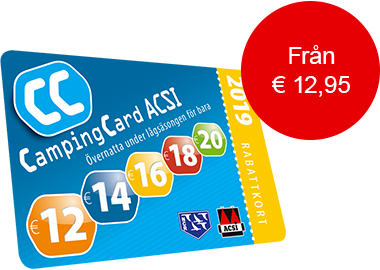 ACSI Eurocampings skickar din informationsförfrågan till "Camping Le Paradis".